Syria’s army entered rebel-held parts of Deraa city on Thursday, state media said, raising the national flag in the cradle of the uprising that sparked the country’s seven-year war. A ceasefire announced last week stemmed nearly three weeks of regime bombardment on the southern province of Deraa, including the symbolic provincial capital of the same name. Until then, the northern half of Deraa city was in regime hands, while the opposition held out in its southern neighbourhoods including Deraa al-Balad. “Syrian army units enter Deraa al-Balad and raise the national flag in the main square,” the official news agency SANA reported on Thursday afternoon. Late Wednesday, it had said the regime and rebels had reached a deal for opposition fighters to hand over their heavy weapons in opposition-held parts of the city. On Thursday, an AFP correspondent in Deraa al-Balad saw a convoy of Russian military police and regime officers enter the city with journalists to raise the flag. But the Syrian Observatory for Human Rights, a Britain-based war monitor, said the flag raising on Thursday was merely “symbolic”. “The rebels are still inside Deraa city,” Observatory head Rami Abdel Rahman said, but had not yet handed over their heavy weapons and there were no signs of any evacuations. Under the deal, “those (rebels) who want to settle their status with the regime will hand over their heavy weapons, keep their light arms and remain in the city”, he said. The reconciliation deal for Deraa city is the latest in a string of such agreements that have seen the Russia-backed regime retake large parts of the country since 2015. The regime retaking full control of Deraa city will be a hugely symbolic blow to the opposition. In 2011, teenagers were arrested for scrawling anti-Assad slogans on the walls of a school in the poverty-stricken city, sparking mass protests against the government. Several of those teenagers picked up arms after the uprising developed into a full-fledged conflict that has since killed more than 450,000 people and displaced millions. The war has since 2011 grown in complexity, drawing in world powers and involving jihadists. The ceasefire deal for Deraa excludes jihadists of the Islamic State group, who control a small corner of the province on the border with both Jordan and the occupied Golan Heights. Overnight to Thursday, an IS affiliate seized a village east of that pocket from rebels who had agreed to a regime takeover. The Jaish Khaled bin Walid group took control of Heet village after deadly clashes, as well as Russian and regime air strikes against them, the Observatory said. Have seen many comments about medical supplies found by Assad forces that are originated from Israel. However despite the claims that Israel is involved in the conflict on the ‘wrong’ side, I didn’t believe it. However it is unbelievable that despite the medical help they provide for the Syrian victims, they send them back to the hell in Syria. Over hundreds of thousands of refugees have moved to the Golan Heights, occupied by Israel. But despite the bloody offensive in southwestern Syria, the Assad regime’s arch enemy limits are closed. However, in the silence and protection of the dark, children are released for care by Israeli doctors. Israel cares for Syrian children in the shelter of the night. Last Wednesday, over 40 people – mothers and their children – crossed the border during the night to meet Israeli doctors. After a quick security check, they were taken to a hospital in the city of Safid, Israel. “They are taken care of at the hospital and go back the same day,” said the Israeli chief and military doctor Sergei Kutikov to Reuters news agency. – Sometimes they come back two or three times for further treatment or for surgery. “We were afraid to come first,” says a woman who does not want to give her name to Reuters. She tells that it was because she had previously only considered Israel as an enemy. The same night as she crossed the border, she was fighting less than a mile from the border to Golan Heights, the AFP news agency said. But the Israeli military has also brought in humanitarian aid to the Syrian refugees who have been to the border lately, the Israeli newspaper Haaretz writes. According to the military, there are several tons of food, medicines and clothes. But more help is needed. “We are waiting for God to help us, on tents, quilts, mattresses and help so that our children can eat and drink,” said Abu Khalid al-Hariri, 36, who fled to Golang border from the city of Al-Harak together with his wife and their five children, to Haaretz. The mother who secretly crossed the border tells her that she stopped watching Israel as an enemy. – That’s the opposite, she says now. In the last five years, after Israel initiated a humanitarian program for Syria, between 4000 and 4 500 Syria have been cared for war in Israel, according to the authorities, Reuters writes. 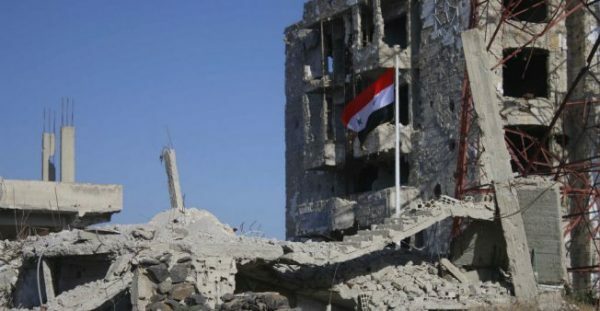 BEIRUT, LEBANON (4:30 P.M.) – Syrian government forces raised the flag of the Syrian Arab Republic in the Daraa al-Balad District of Daraa city, Thursday, following a week-long battle against the Free Syrian Army (FSA). As Al-Masdar News reported on Thursday, an important deal was reached with the militants in the southern districts of Daraa to hand over their medium and heavy weaponry, and be either evacuated or settled in the city.